1/ Combine all dry ingredients (herbes de Provence, powdered garlic, salt and basil) in a bowl and mix. 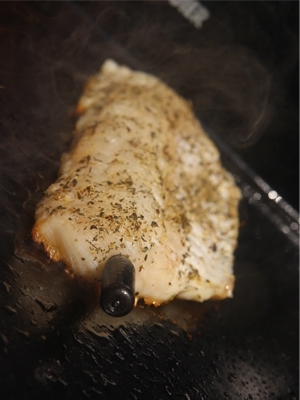 2/ Rub the cod fillets with olive oil and sprinkle generously with the dry ingredients mixture mentioned above. 3/ Preheat a plancha grill or pan. 5/ cook for approximately 7 minutes. 6/ Take the fish off the heat once the probe sounds the end of cooking time. 7/ Serve immediately with lime juice.